Wearing orthodontic braces may be the best choice for correcting your teeth and improving your smile, and that’s why you’ve come to see Dr. Darbro at Darbro Orthodontics. 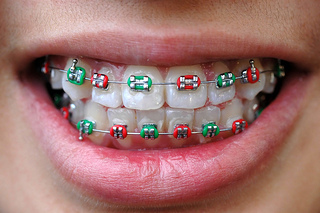 Braces, which consist of brackets and wires, work by gently applying pressure to the teeth, and that pressure causes them to move into the correct position. In some cases elastics, or rubber bands, are used to apply additional pressure needed to move your teeth. The Purpose of ElasticsCustomized for each patient, the rubber bands typically stretch over tiny loops on the top and bottom brackets. If worn consistently, and every day, these tiny elastics will apply the steady pressure needed to guide your teeth into the correct position. Rubber bands are a key part of your orthodontic treatment, and learning how to remove and replace them is an important part to maintaining your braces. Before we set you on your journey to a perfect smile, we’ll make sure you understand all there is to know about how to take care of your braces. Of course, if you have any questions about your orthodontic treatment, or orthodontics in general, be sure to contact our Greenwood, IN office, and our staff will be happy to assit you! If your old holiday routine has gotten stale, leave your green T-shirt in the drawer and try one or all of these tips. Don’t be surprised if you have so much fun that you decide to start a new, annual St. Patrick’s Day tradition! Have a happy St. Paddy’s day! This is a question we hear all the time. Malocclusion, or what we call having a “bad bite,” is the improper alignment of teeth and/or jaws. When your teeth and jaws are not properly aligned, it may impact your bite, the ability to properly care for your teeth, your gum tissue health and even your appearance. Most people will experience some degree of malocclusion, but it generally is not severe enough to require orthodontic treatment. If your malocclusion is serious enough, however, treatment may be necessary to correct the issue. Untreated malocclusion can lead undesirable mouth problems, including tooth decay, gum disease, or chipped and cracked teeth. The most common solution for malocclusion, of course, is orthodontic treatment. The actual course of treatment, including the length of time you will require braces, will be determined by severity of your malocclusion. The goal of your treatment is to move your teeth into the proper position and correct any misalignment in the jaw. We use the most advanced technology in the field in order to ensure that you receive the best possible results. If you have any questions about malocclusion or about starting your orthodontic treatment, please give us a call! I’m 28 – are orthodontics right for me? Thank you for the question. In an age—and society—where looks matter as much as anything, and at a time when evenly-aligned teeth might be the difference between getting a job or a promotion, adults are choosing—wisely, we think—to invest in orthodontics. Orthodontic treatment can be successful at any age, and we know that adults especially appreciate the benefits of a beautiful and healthy smile. If you are still apprehensive about getting braces as an adult, there is another straightening teeth option called Invisalign, which uses a series of invisible, removable and comfortable aligners that no one can tell you’re wearing. If you’ve been thinking about getting that perfect smile, we would love to have you visit for an initial consultation! Please give us a call to set one up! You are currently browsing the The Darbro Orthodontics Blog blog archives for March, 2013.